August 21st, Matt Stairs hit his 21st home run as a pinch hitter… breaking the ALL-TIME record in the bigs. Watch the video here. 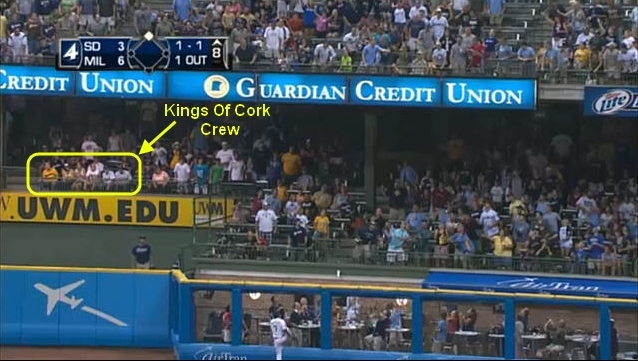 A small group from the Kings of Cork happened to score some front row bleacher tickets for the game and got to see the blast up close and personal. This game was an all out slugfest (so was Friday night’s game) with the correct team on the winning end for both games. We figured this home run ball had to be a monumental MLB mark because Chris Dickerson, in right field, quickly rounded the ball up and through it into the San Diego (that’s spanish for a whale’s…) bullpen directly in front of us. It wasn’t until watching SportsCenter Saturday night we found out exactly what the ball’s meaning was (and noticing us sitting comfortably in the front row seats). Where will Matt Stairs be next year? Hopefully a new team so that he can hold the All-time record outright for playing for the most Major League teams in a single career. A few of us were also quietly hoping the Brew Crew would bring in Hell’s Bells (Trevor Hoffman) for a 1 out save in the 9th to get him to 599 career saves and a possible chance at 600 saves in Sunday’s matchup against his former ball club, but that didn’t happen with Axford taking a 5 out save. Hoffman will get his chances soon enough.